The English Cocker Spaniel is one of several varieties of Spaniel and somewhat resembles its American cousin, the American Cocker Spaniel. 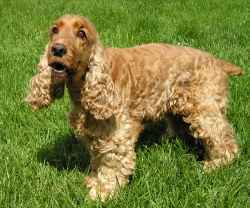 The breed is usually known simply as the Cocker Spaniel. This breed, like many others with origins as working dogs, has genetic lines that focus on working-dog skills and other lines that focus on ensuring that the dog's appearance conforms to the breed standard. After the Second World War, the show-bred Cocker Spaniel increased enormously in popular appeal and, for a period of time, was the most numerous Kennel Club registered breed. This popularity increased the view that all the spaniels were useless as working dogs. Today, this breed is beginning to experience a resurgence in usage as a working dog. Working-dog lines often have physical characteristics that would prevent them from winning in the show ring, such as heads that are more domed than desired or other traits. This most likely is a result of the crossbreeding of other breeds into the working lines to enhance the working skills for much longer than occurred with the show lines. Eventually, kennel club rules prohibited the crossbreeding of other breeds, and working-line Cockers today show less variation than in the past.